Two can have fun at the same time! Cool Math: 2 Player Game for Kids and Adults is one of those fun educational games where two players fight each other mathematically. Cool game for kids and adults is here! Test your math skills in a race against your friends! The screen is split in two thus very convenient for duel games. This is a concentration game that stirs your brain in a positive way. Multiplayer games are in right now, and this is the best game to play with friends. This and similar math games are what makes math fun. All you have to worry about is to give the correct answer for the equation faster than your opponent and your score will go up! Don't even think about lucky guessing – you’ll lose 1 point for every wrong answer. It is fun, competitive and educational game for kids. 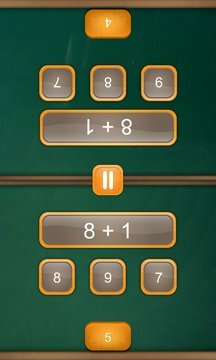 Kids, play 10 games in a row and you are ready for the test in your schools, and parents gather together and revise your math with the help of this multiplayer game!